Nowadays, everyone is making lots of money online. The growth of the internet world is so fast these days. And every single minute we came across tons of offers and new things or hacks to earn money online. People like bloggers, content writers, publishers, freelancers, online marketers, affiliate marketers etc. are earning huge money online by implementing marketing strategies. Many online people are now looking for an option to receive and send the money or the funds they earned online with a secure gateway. And PayPal is the best choice. Here we find an option with a name as PayPal. PayPal is one of the best services which gives you a facility to send or receive funds across the world by maintaining the security high. PayPal is nothing but a gateway through which anyone can send and receive money online across the world. And this is the reason why PayPal is used worldwide. 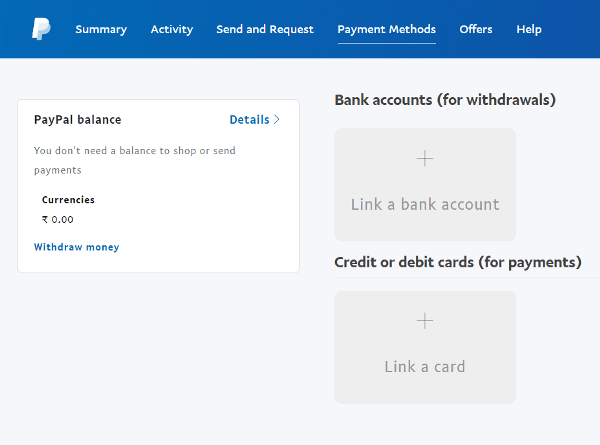 So, if you have a PayPal account then you can send money to anyone in the world or can receive money from anyone too. Also, now the PayPal is adopted by thousands of sites and it goes on increasing day-by-day. 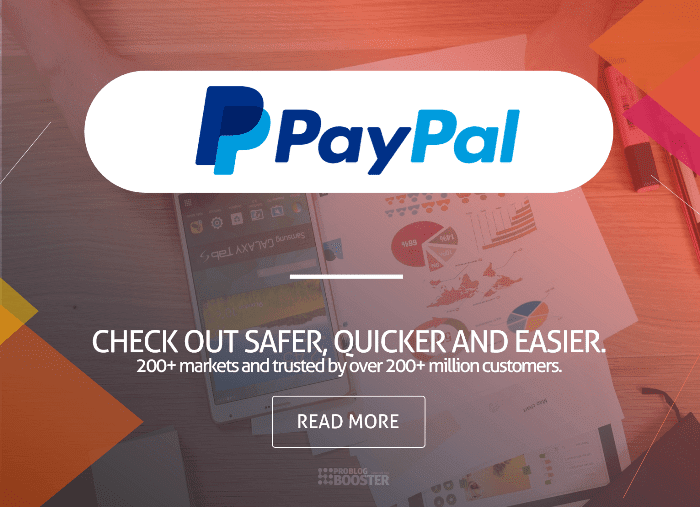 However, many merchant sites seeking for the users who are holding the PayPal account so that those sites can make money transfer through the PayPal gateway. Because of its high-security protocols; most of the companies prefer to send your earnings in your PayPal account. In a previous post, I was talking about Facebook paid research program that allows you to make money up to $25/month for free for doing nothing. 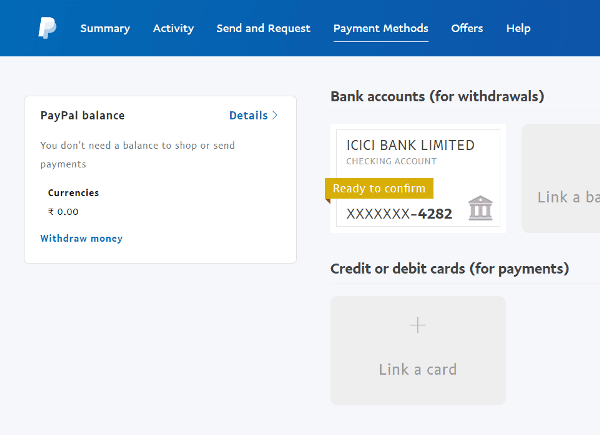 Here PayPal is the way by which you can withdraw your money to your bank account. Thus, in simple words, PayPal is like a bridge (gateway) between two cities (banks) through which the cars (money) are moving to and from cities (banks). I would recommend this option to everyone who is making money online and interested to have a channel through which they handle their funds yet by upholding the security. Simply complete a transaction of Rs.400 and above on any merchant accepting PayPal on your eligible purchases and get a cashback of Rs.200. This offer is valid only for the first transaction through your PayPal India Account and can only be availed once per user. There are many other payment gateways available as well but PayPal is treated as one of the preferred, convenient, reliable and secures across the world. The basic concept is, a front person transfers the money from their PayPal account to your account and in short period of time, your money will be transferred by PayPal and then to your verified and registered bank account. 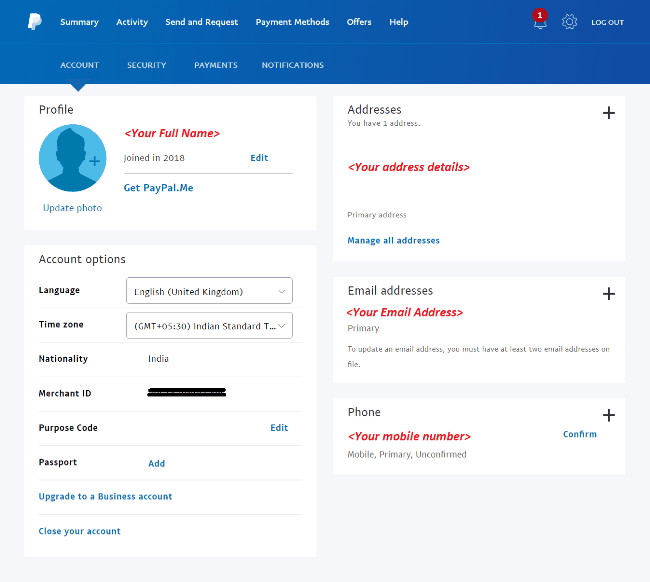 Anyways, if you are not a PayPal account holder, you have now stopped at a perfect stop where I will explain to you how to create and verify PayPal account with as minimal steps as it can be. This is one of the must-have things for creating the PayPal account. PayPal is a gateway which acts as a mediator between two parties and these parties are nothing but a bank. 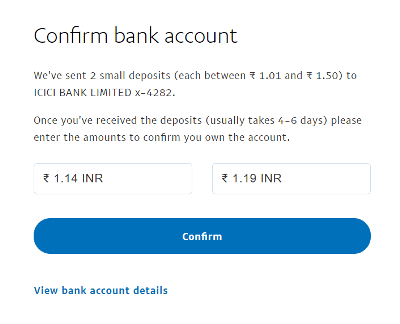 If you are not a valid bank account holder, you will have to create it by visiting the bank before creating a PayPal account. You can even use a bank account of your father, mother or spouse, but, I don’t recommend you use their accounts. So, it’s better you should have your own bank account before creating a PayPal account. 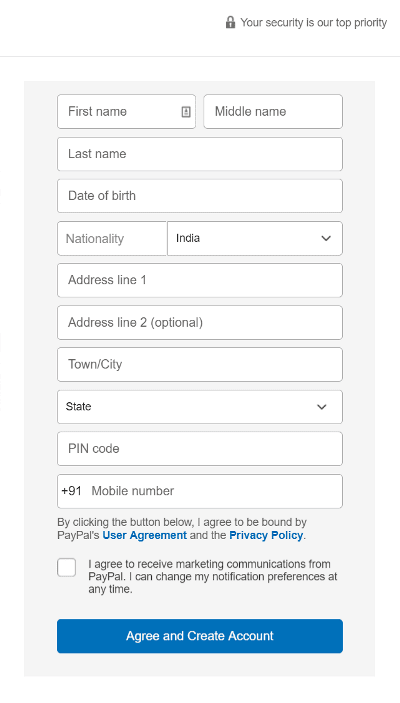 You have to have PAN number while creating PayPal account. Also, make sure that the name mentioned on PAN card should match with your bank account name. If you don’t have PAN card, you should apply it immediately. But, it may take a month of a time to issue a new PAN card. So, apply it as sooner as you can. Here you can also use PAN card of someone else, but name/details on both PAN Card and bank account should be matching. Otherwise, you will find difficulties while following a process to create a PayPal account and also withdrawing the amount. And this is the last must-have thing. This email id and password you should remember and should not share with anyone same as that if you keep your bank account username and password secure. 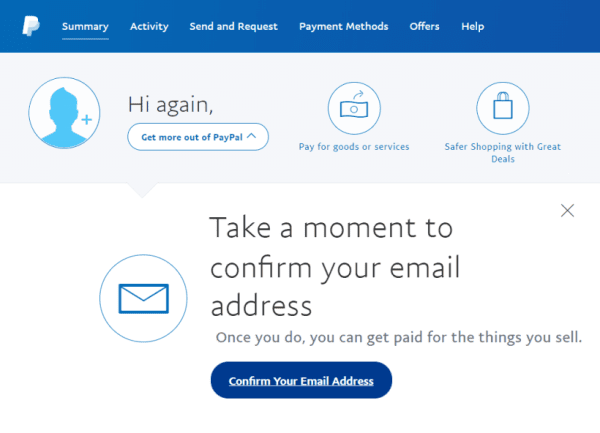 You need to have one email id to create your PayPal account. 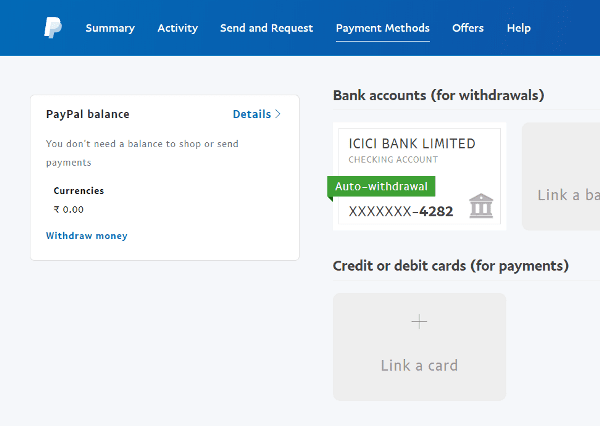 Please note, say if you are not holding any bank account, still you can open a PayPal account. But, PayPal team will treat your account as an Unverified account. And it will get Verified after you add the bank details to it. One more thing, opening a PayPal account is TOTALLY FREE !!! 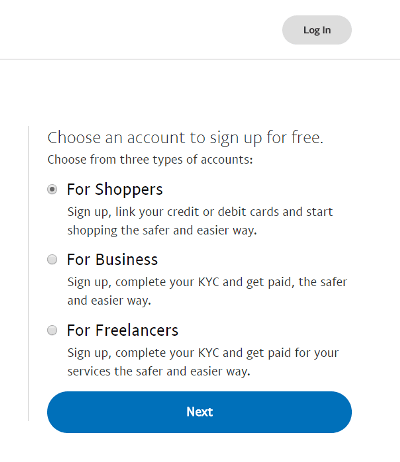 Step 1: Go to the official PayPal website. And click on a Sign-Up button. You will see something like shown in the picture. Step 2: Choose the account type. Select For Shoppers option and click on Next button. Step 3: Sign up an individual account. Enter your valid email address, Password and click Continue button. Step 4: Submit your account details. Now fill all the valid details in mandatory fields and make sure that those should match with your bank account details. Then click on Agree and Create Account button. 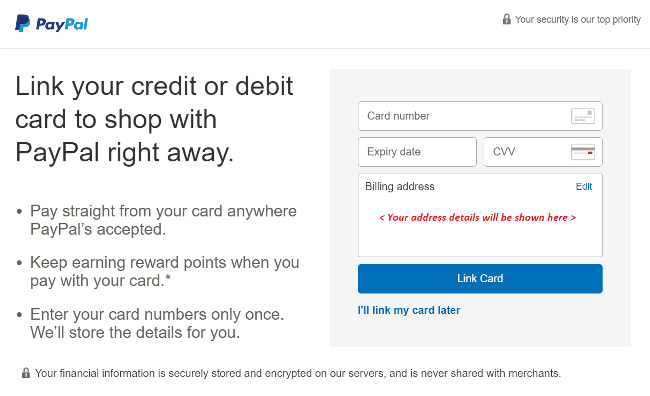 Step 5: Add your card details. You will be asked to enter card details or you can skip it by clicking I'll link my card later link. Step 6: Go to your PayPal dashboard. 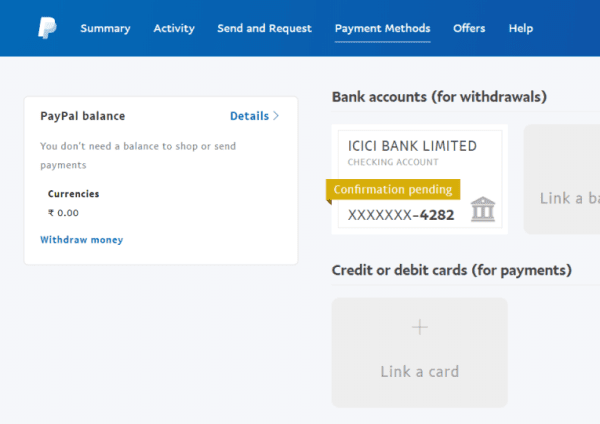 Now click on My PayPal link displayed in the header. Step 7: Choose the payment method. Click on Payment Methods link. Click on Link a bank account option. 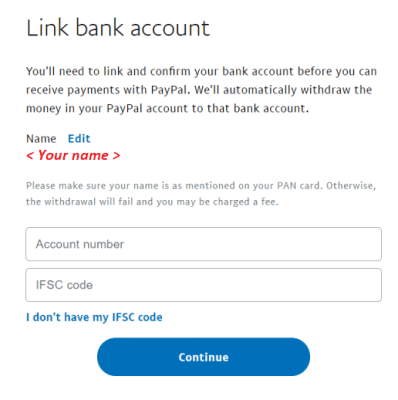 Step 9: Add bank details to link with PayPal. Enter Bank Account number and IFSC Code and click on Continue button. Step 10: Verify bank account. You will see a message as shown in the image. Then click on Confirm in 4-6 Days button. Then, your bank account will be added successfully. But, with a status as Confirmation Pending. 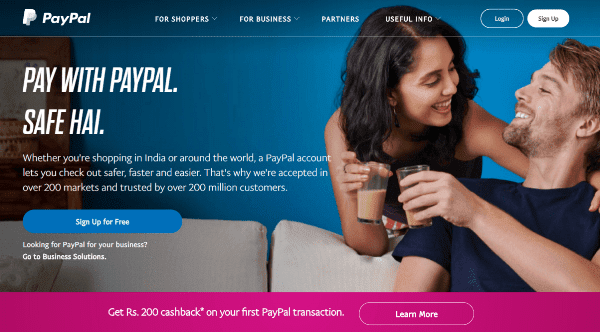 Now you will have to wait for 2 transactions to be made by PayPal team in your bank account. Both the transaction will be done by them between 1.01Rs. to 1.50Rs. (You may get different amount) within 4-6 days. Step 11: Verify mobile number. While verifying bank account, you can verify your email address and Mobile number. Step 12: Adding an email ID. 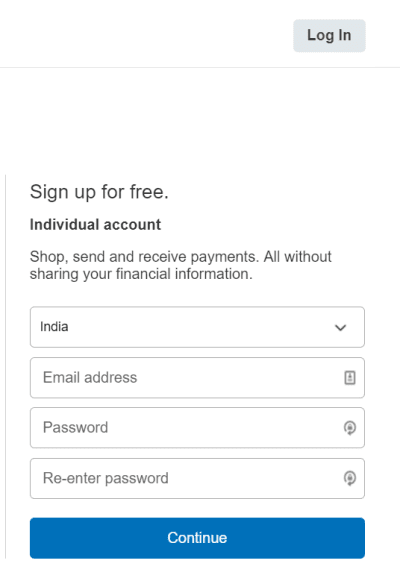 Login to PayPal account with Email ID and Password. Step 13: Confirming email ID. Click on Confirm Your Email Address button. Step 14: Verifying email address. Click on Send Email button and verify your email address by clicking activation link received on given email address. 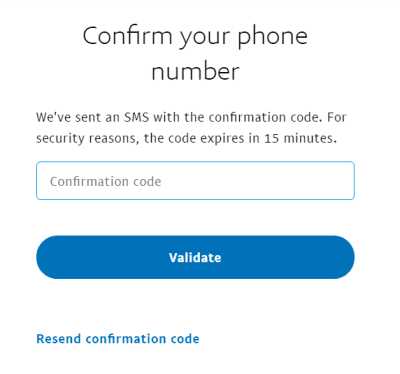 Step 15: Add mobile number. Now click on Confirm Mobile option displayed under Summary tab. Step 16: Authenticate your number. Enter OTP received on the registered mobile number and click the Validate button. Keep an eye on your bank account transaction and note down the 2 credit transactions performed by PayPal team in your account. Step 17: Verify bank transactions. After these transactions took place, again login to PayPal account with Email ID and Password. Step 18: Check and confirm bank details. Click on Payment Methods link. You will see a message as Ready to confirm for added bank details. Step 19: Authenticate your bank. 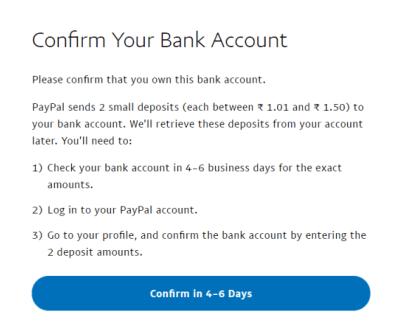 Now PayPal asks you to enter 2 amounts which they have credited in your bank account. Enter both the amounts correctly and click on Confirm button. Step 20: Get verified your PayPal account. Now the status of your added bank account is displayed as Auto Withdrawal. This means your PayPal account is now Verified. 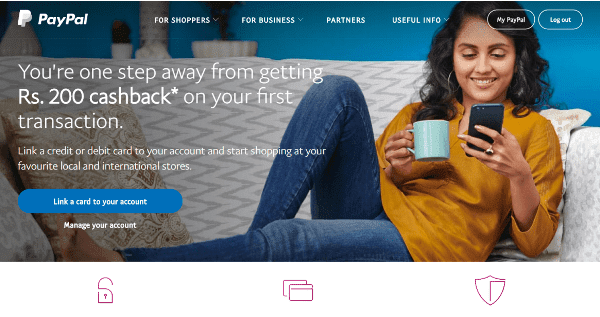 Whether you're shopping or buying in India or around the world, a PayPal account allows you to check out safer, quicker and easier. That's why is so popular payment gateway and widely accepted in over 200+ markets and trusted by over 200+ million customers.